Our Labrador Molly loves playing on the beach. And at this time of year, when the weather is OK-ish and the beaches aren’t yet particularly crowded, we all like to go for a nice walk by the sea. Admittedly, with the Severn estuary having one of the highest tidal ranges in the world, the sea can often be quite a way away. 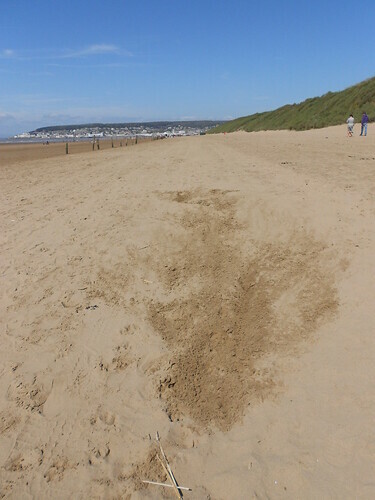 But the beaches are long, sandy and have plenty of room for throwing a ball. There’s also usually something interesting going on. 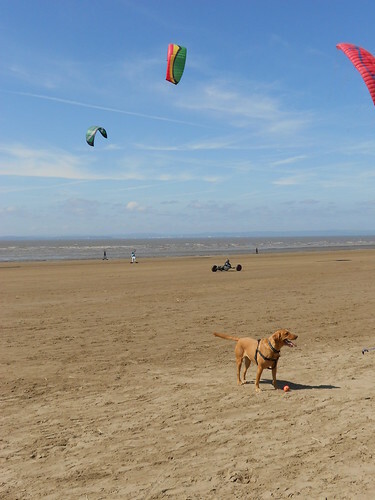 Here’s Molly the other weekend, surrounded by kitesailors. The best thing about playing on the beach with Molly, though, is her sheer enthusiasm. When I throw the ball, she hares after it like a bat out of hell. And instead of slowing down when she catches up with the ball so that she can pick it up gracefully, she continues full pelt and hurls herself bodily at the ball with unrestrained glee. Sand flies in all directions as she comes to an ungainly, and not very well controlled, stop in a giant, four-pawed skid. She beams a sandy grin, her ball lodged firmly in her mouth. Here’s what the aftermath looks like. It’s difficult to see the scale in the photo, but this skidmark is about thirty feet long. Having retrieved her ball, she turns and races back towards me. She picks up speed as her paws find grip in the soft sand. Her eyes gleam as she sees me and she puts her head down, all effort directed to reaching me (purely so that I can throw the ball again) as quickly as her body – and air resistance – will permit. I can see her leg muscles pumping away like furry orange pistons. She continues to accelerate even as she approaches where I’m standing. There’s no way she can stop in time. I close my eyes and brace for impact. This entry was posted in Dogs, Photography and tagged Beach, Dogs, Molly, Photography, Walking by Simon Perks. Bookmark the permalink.